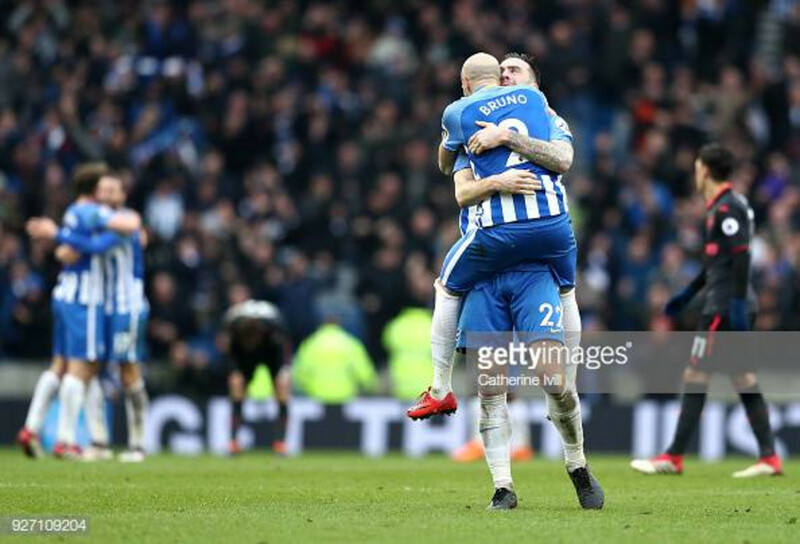 Brighton's Bruno and Shane Duffy celebrating beating Arsenal last season, image courtesy of Getty Images.Catherine Ivill. Brighton vs Arsenal Preview: Can the Seagulls provide fans with a late Christmas present against an in-form Arsenal? Brighton & Hove Albion are hoping to give their fans, the best Christmas gift by beating Arsenal at the Amex Stadium tomorrow. Arsenal have had mixed fortunes at The Amex, but especially in the Premier League, as last season Albion beat the Gunners 2-1 at The Amex. The Seagulls go into the game against Arsenal having lost their last three games against Burnley, Chelsea and Bournemouth and have only scored one goal in their last three games. However, Arsenal head into the game having won their last game 3-1 against Burnley, but having lost their previous two games in all competitions prior to Burnley, losing to Tottenham in the cup and Southampton in the league. Brighton will be without centre-half and vice-captain Lewis Dunk, who serves a one-game ban after being sent off for two bookings against Bournemouth. Brighton will also be without Alireza Jahanbakhsh, who links up with the Iran squad for the Asia Cup and Jose Izquierdo who misses out with a knee injury, which has kept him out for over three weeks now. The Seagulls will be boosted by the return of centre-half Shane Duffy to the squad after he has missed Brighton's last three games after being sent off in the win over Crystal Palace. The injuries and suspensions mean Brighton should lineup as follows: Ryan, Montoya, Duffy, Balogun, Bernardo, March, Propper, Bissouma, Locadia, Gross and Andone. Arsenal will also be without a few of their big players. Hector Bellerin will be missing with a calf injury, Henrikh Mkhitaryan has been ruled out with a broken foot which will keep him out for six weeks. They could also be without Nacho Monreal and Shkodran Mustafi, who are doubts with hamstring injuries. Danny Welbeck, Rob Holding, Konstantinos Mavropanos and Emile Smith Rowe will also be missing. Two players that will be key to the result tomorrow are both sides strikers in Florin Andone and Pierre-Emerick Aubameyang. Andone has been a handful for many defenders since coming into the side after signing in the summer from Deportivo La Coruna. Andone has scored two goals since coming into the side including the third against Palace and the winner against Huddersfield. Aubameyang has been in superb form, scoring 12 goals in the Premier League this season, including a brace in his last game against Burnley. One thing is for sure if Andone and Aubameyang turn up tomorrow, it could be an entertaining and high-scoring game.